From a 21st-century perspective, looking to our medieval ancestors for help in understanding the mind would seem to be a backward step. Those were the days, we think, of supernatural forces intervening in human affairs, and with views of medicine, biology and psychology that strike the modern reader as primitive and unsatisfyingly pre-scientific. A progressive view of human knowledge that sees it as inexorably proceeding towards greater understanding would suggest that we have little to learn from a psychology dating from the days before science. Yet ideas about the mind in the medieval period, itself a huge span of time (from the late classical period to the 15th century) that saw many shifts in thought, were much more sophisticated than that caricature would allow. Here, we set out some prominent medieval models of mind and their implications for understanding memory, imagination, emotion and the relations between mind and body. Why should we look back to medieval ideas about the mind? One reason is that the Middle Ages saw considerable engagement with questions of mind, body and affect, and the development of sophisticated thinking about psychology – at least among the educated élite, many of them clerics, who read and wrote the texts that have been passed down to us. Another reason is that medieval texts open onto a psychology that was not dominated, as many recent discourses are, by essentially Cartesian notions of mind–body dualism. Before Descartes, mind and body were seen to interlink in ways that have a remarkably modern flavour. Understanding medieval psychology, though, is fraught with problems. Interpreting any texts or images from so long ago requires a shift of belief systems, in order to appreciate the ontology and background of assumptions with which medieval thinkers operated. Social and cultural contexts were very different. Western medieval writing assumed a Christian thought world, and writing was frequently seen as the domain of men. Psychology was most of all the realm of theologians, who were interested in questions of desire, will, intention, sin and virtue. We cannot look for a straightforward cross-section of medieval thought: much writing is by religious men, and personal testimonies and accounts of experience are inevitably filtered through assumptions concerning gender, class and religious belief – as well as genre. But hazards are also opportunities: medieval piety foregrounded affective experience, meditation and prayer, and the need to shun distractions in order to stay focused on those tasks. We can also look to imaginative fiction, which offers especially valuable insights into cultural attitudes and experience, of both men and women, and which suggests how ideas of mind, body and affect carried over into secular culture. We aim to show how medieval writers approached the mind, highlighting some areas in which their ideas are particularly relevant to, and even prescient for, today’s scientific psychology. Just as modern psychology can be understood as a development of and challenge to Cartesian ideas about the separation of mind from body, so medieval writers about the mind were working from the starting point of a particular intellectual landscape. Hippocrates’ theory of the four humours, developed by Galen in the second century ce, underpinned the notion of a mind–body continuum, for humours shaped both mind and body. The distinction between mind and body was complex and more fluid than in post-Cartesian thought, complicated by ideas of the soul, by different views on where in the body faculties were situated, and by the integration of thought and affect. The term ‘mind’ originated with the concept of memory, but quickly came to overlap with notions of the soul, and took on at least some aspects of current definitions of mind. Aristotle had situated the rational or intellective quality within the soul, and had located the heart as the centre of the senses and cognitive faculties; Galen by contrast associated these with the brain. Neo-Platonic theories situated the immortal and rational part of the soul in the head, and the appetites and emotions in the trunk of the body. In the fourth century, St Augustine saw the will as a faculty of the (superior) soul and associated emotions with the (lower) body, but also saw emotions as having both cognitive and bodily aspects (Kemp, 1990). Something like a recognisable scientific psychology came into focus towards the end of the 13th century, following the 12th-century rediscovery of Aristotle and the translation of many Arabic medical texts into Latin. Thinkers of this period such as Avicenna, Thomas Aquinas, Albertus Magnus and Roger Bacon developed complex theories of mind. Observations of the effects of head injuries had confirmed Galen’s view that the rational aspects of the psyche were located in the brain (although popular notions persisted through the Middle Ages and beyond of the heart as the site of understanding and feeling). What we would now call cognition was understood as a two-part process, with physiological mechanisms in the brain mirrored by processes within the rational soul/mind, and with neither reducible to the other. The brain was instrumental in transforming the ‘vital spirit’ (one element of a three-part system of spirits deriving from Arabic philosophy) into the ‘animal spirit’, which controlled sensation, movement, imagination, cognition and memory. The main work was done by the cerebral ventricles, which housed the ‘inner senses’, responsible for integrating data from the external senses and constructing thoughts from their component concepts or ‘forms’ (imagines or phantasmata). Perception worked by the reception of sensory impressions in the anterior part of the brain (the sensus communis or ‘common sense’) and their temporary storage in the imaginatio (an early version of working memory). Those impressions were then passed on for creative shaping in the middle part of the brain, the imaginativa (later termed ‘phantasy’), where another area known as the estimativa could get to work with its making of memory-based and affectively-coloured judgements. Finally, in the back part of the brain, the cellula memorialis was the storehouse of memory. The phantasmata that resulted from this multi-stage process were no mere abstract concepts: they dripped with sensory qualities and emotional charge. The mind–brain complex was an integrated, dynamic system, with the creative power of the imaginativa having the potential to sway and deceive the rational processes of the estimativa. The delicate balance of the four bodily humours (black bile, yellow bile, blood and phlegm, associated respectively with the melancholy, choleric, sanguine, and phlegmatic temperaments) could affect the dynamic interplay of the cerebral faculties, with an excess of black or yellow bile, for example, affecting the image-production systems of the front of the brain, resulting in anomalous perceptions and melancholy or mania. The faculty of memory had a special status in medieval thinking about the mind. The historian of ideas Mary Carruthers has argued that the medieval conception of memoria embodied something much richer than modern notions of memory as a passive store of information. For thinkers of the Middle Ages, remembering was an active, reconstructive process involving the recombination of different forms of information into new cognitive representations. In its generation of alternative non-real scenarios, this model of remembering presaged modern approaches that see memory as a process of imagination as much as information storage. For the clerics who wrote many of the texts that have come down to us, memoria was a ‘a universal thinking machine’ (Carruthers, 1998), a technology for meditation and the means for creating new thoughts about God. In Carruthers’ analysis, a memory representation formed a complectio, incorporating emotional and motivational elements as well as cognitive, prefiguring modern ideas about memories as inherently emotionally coloured. Medieval scholars’ emphasis on the spatial nature of memory reconstruction, as evidenced by their enthusiasm for mnemonic techniques such as the method of loci, also prefigures the cognitive neuroscience of scene construction (Hassabis et al., 2007), with its emphasis on the spatial rather than temporal properties of memory representations (Fernyhough, 2012). As the example of memory demonstrates, soul, mind, intellect, thought, emotion, affect, senses and body were all intimately connected in medieval writings; emotions both shaped the understanding and were visibly written on the body. From a medieval perspective, the mind was inevitably embodied – a view that contrasts strikingly with mind–body dualism and Descartes’ influential concept of emotions (‘passions’) as felt exclusively in the mind (‘soul’), even though they might have physical causes (Saunders, 2005). This theory of emotions as private mental events underpinned subsequent philosophical explorations, and the late-19th-century psychologist William James was radical in his suggestion that emotions were perceptions of bodily processes. Yet his ideas, like Merleau-Ponty’s (e.g. 1962) theories of embodiment and the more recent development of theories of embodied cognition (Bergen, 2012; Clark, 1997), chime closely with medieval understanding. In adopting such ideas, contemporary neuroscience, philosophy and psychology have moved over the last several decades to a position surprisingly consonant with that of the medieval thinkers. Antonio Damasio, for example, looks back to James in privileging the body, replacing the Cartesian mind–body split with the notion of a dynamic continuum between brain and body. Emotion enables cognition, Damasio suggests, playing a key role in rational/intellective processes: the cognitive is always emotional; the emotional always cognitive (Damasio, 2008). This seemingly radical new idea of the embodied mind, however, was prefigured a millennium ago, and underpinned thought and writing for many centuries following. Medieval literary texts are rooted in these notions, and writers shape powerful fictions that exemplify the interdependence of mind and body, cognition and affect, within a worldcoloured by a profound awareness of a multi-faceted supernatural, which included not only God and the devil, but also a spirit world of angels, demons and ghosts. Such ideas are clearly at play in the ‘psychomachia’ tradition, a genre in which aspects of individual psychology are personified and brought into dramatic contact. In the late-14th-century poem Piers Plowman the hero Will meets and debates with figures who personify both affective and cognitive forces – Anima (Soul), Imaginatyf and Conscience – as well as external forces such as Holy Church and Scripture. The psyche is envisaged and exteriorised as made up of voices in contention and conflict, within a larger frame of competing forces. The single most influential literary topos of the period is the idea of love-sickness, which combines the idea of mental and bodily illness, and draws expressly on the notion of love as a supernatural, invasive force, creating psychical disorder. Geoffrey Chaucer’s great tragic narrative of love Troilus and Criseyde (1380s) exploits the convention of love-sickness, which originates in classical writing: the inner journey of love is throughout written on the body (Chaucer, 2008). Love comes from ‘out there’: it is an invasive, physical force, a wound with which the God of Love punishes Troilus for his laughter at the foolishness of lovers. On first seeing Criseyde, Troilus is, ‘Right with hire look thorugh-shoten and thorugh-darted’ (I, 325): the image plays on the neo-Platonic convention of the eyes as the way to the heart, which is caused to ‘sprede and rise’ (I, 278), wounding and quickening Troilus’ affections. He manifests the typical symptoms of the malady of love: weeping, sighing, swooning, melancholy and physical decline. Love is depicted as inevitable, but also as a kind of death-wish. In the later books of the poem, when Troilus is separated from and betrayed by Criseyde, he is literally unmade by love, his melancholy characterised by swoons, nightmares, withdrawal and abstinence, until finally he wastes away to a shadowy figure of his former self: unrecognisable, pale, wan, walking with a crutch and complaining of grievous pain around his heart. Yet, in the course of the poem, affect has been shown also to have powerful cognitive elements. Troilus is a lyric poet, and the narrative is interspersed with his songs, in which love opens onto a vision of cosmic harmony; it inspires too his own moral excellence. Chaucer also explores the recombinative power of memory, and particularly in the later books imagining is, literally, image-making: Troilus, re-reading Criseyde’s letters, ‘refigures’ ‘hire shap, hire wommanhede, / Withinne his herte’ (V, 473–74). He has the ‘proces’, the course of events, ‘lik a storie’ in his memory (V, 583–85). And his grief also leads him to philosophical debate. The poem powerfully depicts the obsessive workings of the mind that has suffered anguish and grief, the endless refiguring of the past, and the processes of inner dialogue. Chaucer is deeply engaged with both the physical and cognitive qualities of emotion, its shaping of body and mind. In his Knight’s Tale Chaucer graphically describes the bodily illness caused by love, but he also situates Arcite’s malady as an illness of the brain, ‘Engendered of humour malencolik / Biforen in his celle fantastik’ (1375–76). Chaucer draws on medical ideas about the influence of affect on the brain, available to him, for instance, through the work of Bartholomaeus Anglicus, translated into English by John of Trevisa. Trevisa describes how the passions of the soul engender the melancholy humour, which works on the ‘celle fantastik’, the front ventricle of the brain or ‘phantasia’, containing the sensus communis and imaginatio (temporary memory), which in turn control imagination and judgement in the middle ventricle. In a state of melancholy, the subject loses the ability to judge and reason; here, this becomes mania, as the imagination cannot perceive new images but sees only the beloved – affect and cognition are interdependent. Arcite’s mind obsessively bodies forth images of his lady. Such ideas play out differently but with equal force in religious writing. The mysticism of the later Middle Ages, in particular, stressed the individual humanity of Christ and the power of affect and sensory experience to move the individual to spiritual understanding and vision. The extraordinary voices and unusual perceptions of two celebrated English religious writers, Julian of Norwich and Margery Kempe, further open out the intertwined notions of mind, body and affect in the medieval world. What we can learn from these ideas and examples that can inform our work as psychologists now? As we have suggested, medieval writings have important implications for current thinking about the relation between brain and mind. The ideas on melancholia and mania that influenced Chaucer, for example, are reminiscent of contemporary views of rumination in depression along with neurobiological accounts of mood disorders as resulting from neurotransmitter imbalances. This has included research linking serotonin levels to obsessive rumination resulting from falling in love (Marazziti et al., 1999), and discussion about possible chemical ‘cures’ for love-sickness (Earp et al., 2013). But while modern approaches to the science of love slip easily into the trap of reductionism, medieval accounts show us ways of avoiding the automatic identification of the psychological with the neural. Medieval thinkers resisted reducing the soul/mind to the brain while at the same time avoiding dualism. St Thomas Aquinas, for example, writing in the 13th century, conceived of the human as a compound of body and soul/mind. As we have seen, such ideas illuminate modern notions of the embodied mind. Though we may replace ideas of soul with those of mind, medieval notions of the relation between the non-material faculties of the soul and brain/bodily processes are powerfully suggestive: they bring to mind co-dependence but not identity. While inevitably not representing developed models and theories, these writings offer sophisticated and complex ways of understanding the relation between brain and mind in the era of neuroscience. Much medieval literature is made strange to us by the period’s limited knowledge of anatomy and the unfamiliarity with scientific method. Yet there are examples of extraordinary insight, for example in the writing on the reconstructive nature of memory and imagination (Dudai & Carruthers, 2005). There may be implications for clinical practice too. To adopt Johan Huizinga’s (1924) phrase, ‘the violent tenor of life’ in Britain in the Middle Ages meant that many people would have had experience of trauma. Primitive medicine and technology rendered illness and famine common, and life expectancy was not high. The plague or Black Death recurred for over a hundred years and in 1348–49 killed as much as a third of the population. Political unrest and warfare were constant realities: the deposition of Richard II, the Wars of the Roses, the ‘Hundred Years War’ with France that lasted through the realms of five kings, campaigns against Scotland and Ireland, and the Crusades. There are reasons to think that medieval minds may, as a result, have been less easily traumatised by exposure to (particularly physical) violence (Skoda, 2013). Differing worldviews and spiritual beliefs would doubtless also have affected individuals’ reactions to such experiences. The prominence in medieval writing of magical and marvellous protective objects certainly suggests their powerful play on the imagination – and the universal hope for health and happiness. Christianity offered a different kind of hope, for divine protection and eternal life. But Christianity also offered resources for accepting suffering, which could be understood as punishment for sin but could also be embraced as a means of refining the soul. It is possible too that the distinctly modern-looking understanding of the relations between cognition and emotion might have had a protective effect. The trauma of violence or death is of course a central aspect of extreme emotional experience, whether this is secular or spiritual: Christ’s passion is affective precisely because of the extreme violence he suffers and the horror of this for the onlooker. The continuum between body and mind meant that physical affects of mental trauma were an expected aspect of extreme emotion. Unusual experiences such as auditory and visual hallucinations were readily seen as such affects – while the demonic and the divine, and the spirit world between, were also accepted as possible causes of such experience. Not pathologising such experience may have made it easier to live with. In a planned follow-up to this essay, we will turn our attention to medieval preconceptions about mental control, intrusions, and anomalous experiences such as hallucinations. In this area in particular, medieval ideas about the mind are guiding modern scholars towards non-reductive understandings of mental phenomena that can do justice to the richness and variety of human experience. As a term like the ‘Dark Ages’ colourfully demonstrates, the medieval period is often associated with ignorance and superstition. Yet while its frameworks for belief were indeed very different, its thought world was complex and sophisticated. Much of what we now term ‘superstition’ – for example the colourful beliefs surrounding Hallowe’en – has its origins in serious religious rituals, but has often been overlaid with notions of the ‘pagan’ and more recent borrowings. Post-Reformation ideas placed religion and magic in opposition, whereas medieval Christian belief included concepts of the supernatural: a spirit world comprising not only God and the devil, but also spirits, ghosts and fairies, and magic. Separating religion from magic resulted in what had been acceptable religious rituals, such as the veneration of relics, becoming superstition, and in the demonisation of the supernatural. It is no coincidence that the figure of the witch (whose roots go back to classical times) took hold during the early modern period, and that witch-hunting with all its attendant suspicions was only seen in Britain after the Middle Ages. Hallowe’en finds its origins in rituals surrounding All Hallows’ Eve, the night before All Hallows’ Day (now generally referred to as All Saints’ Day), which is followed the next day by All Souls’ Day, the religious festival honouring the souls of the dead. Hallowe’en may use some of the rituals that marked the Celtic harvest festival of Samhain, and is thought, like other feasts, to have been established in order to Christianise a popular pagan festival. It may, however, simply be the case that both pagan (including Roman and Celtic) and Christian religion developed similar rituals to honour the dead at the time in which autumn was moving into winter, and death marked the natural world. This night was also believed to be the night on which spirits walked: revenants from the dead. All Hallows’ Eve was associated across Europe with visions or pageants of the danse macabre, a dance of skeletal figures, returning spirits reminding spectators of their own mortality. 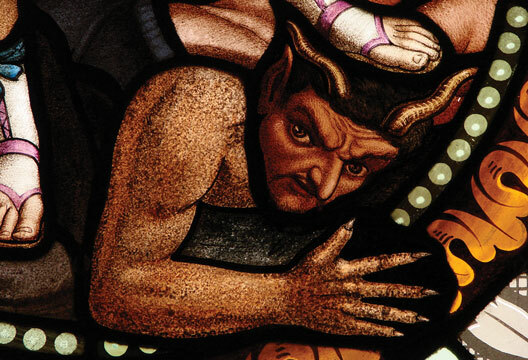 After the Reformation, the spirits of the dead were demonised – seen as witches and demons. Ghosts and suchlike are still associated with Hallowe’en, as are black cats, sometimes viewed as witches’ ‘familiars’ (their intermediaries with the devil). Jack-o’-lanterns seem to have originated in ancient Irish practice, while trick-or-treating finds its origins in medieval pageantry rituals of ‘mumming’ and ‘souling’, collecting ‘soul cakes’ in return for prayers for the dead. Some of these practices were borrowed back, slightly altered, from traditions that grew up in North America, such as the use of pumpkins. The vibrancy and remaking of Hallowe’en rituals across the centuries speaks in part to the appeal of folk tradition, to our engagement with both religious belief and superstition, but also to a deep-seated need to honour and remember the dead – and to turn fears of mortality into feasting and festivity. - Charles Fernyhough is Professor in the Department of Psychology, Durham University, and PI on the Hearing the Voice project. Bergen, B. (2012). Louder than words: The new science of how the mind makes meaning. New York: Basic Books. Carruthers, M. (1998). The craft of thought. Cambridge: Cambridge University Press. Chaucer, G. (2008). The Book of the Duchess, The House of Fame, The Parliament of Fowls, The Legend of Good Women, Troilus and Criseyde, The Canterbury Tales. In L. Benson (Ed.) The riverside Chaucer. Oxford: Oxford University Press. Damasio, A. (2008). Descartes’ Error. London: Random House. Earp, B.D., Wudarczyk, O.A., Sandberg, A. & Savulescu, J. (2013). If I could just stop loving you: Anti-love biotechnology and the ethics of a chemical breakup. American Journal of Bioethics, 13(11), 3–17. Fernyhough, C. (2012). Pieces of light: The new science of memory. London: Profile Books. Hassabis, D., Kumaran, D., Vann, S.D. & Maguire, E.A. (2007). Patients with hippocampal amnesia cannot imagine new experiences. Proceedings of the National Academy of Sciences, 104(5), 1726–1731. Huizinga, J. (1924). The waning of the Middle Ages. London: Edward Arnold. Kemp, S. (1990). Medieval psychology. New York: Greenwood Press. Marazziti, D., Akiskal, H.S., Rossi, A. & Cassano, G.B. (1999). Alteration of the platelet serotonin transporter in romantic love. Psychological Medicine, 29(3), 741–745. Saunders, C. (2005). ‘The thoughtful maladie’. In Corinne Saunders and Jane Macnaughton (Eds.) Madness and creativity in literature and culture (pp.67–87). Basingstoke: Palgrave Macmillan. Skoda, H. (2013). Medieval violence. Oxford: Oxford University Press.